Leaving behind the exhilarating energy of Barcelona, we hopped onto a train and headed south. Our destination? Tarragona! Everything moves at a much slower pace one hour south of Barcelona. Tarragona Cathedral during the golden hour. It’s location is perfect for those wanting to explore an interesting mix of sights and Catalonian culture. 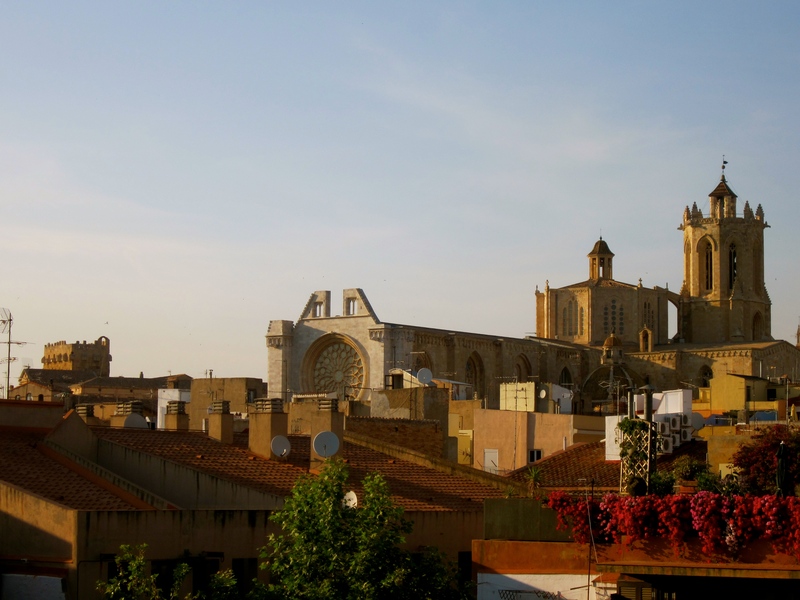 Tarragona’s ancient Roman architectural marvels have been designated a UNESCO World Heritage Site. 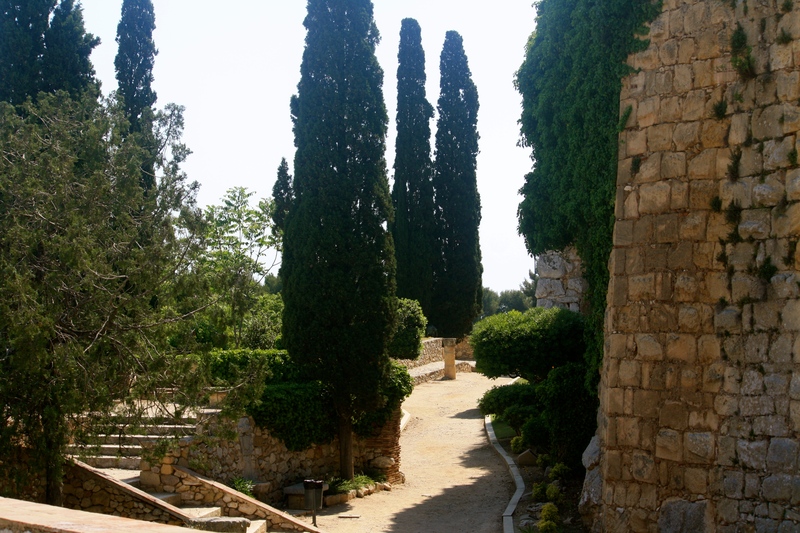 Path along the ancient city walls. 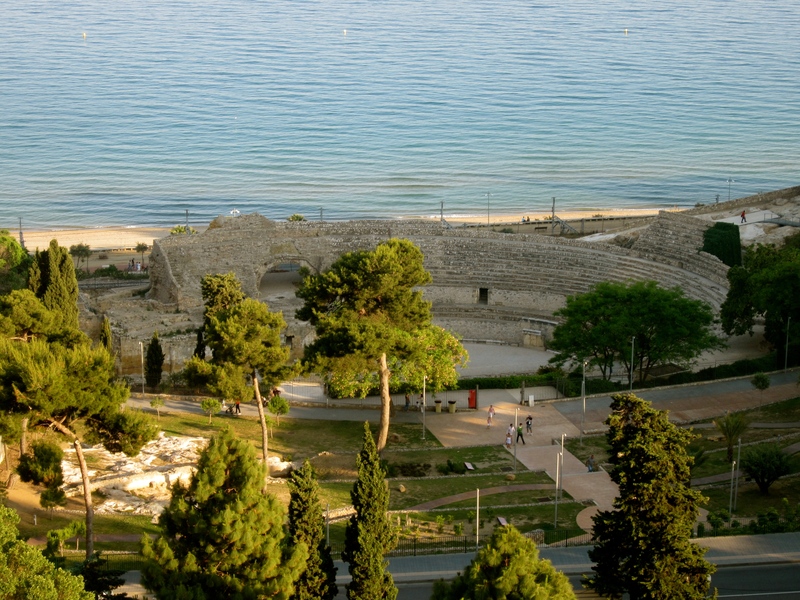 Tarragona, or as the Romans called it, Tarraco, has some of the best preserved Roman ruins in Europe. Above old town towers a beautiful cathedral. 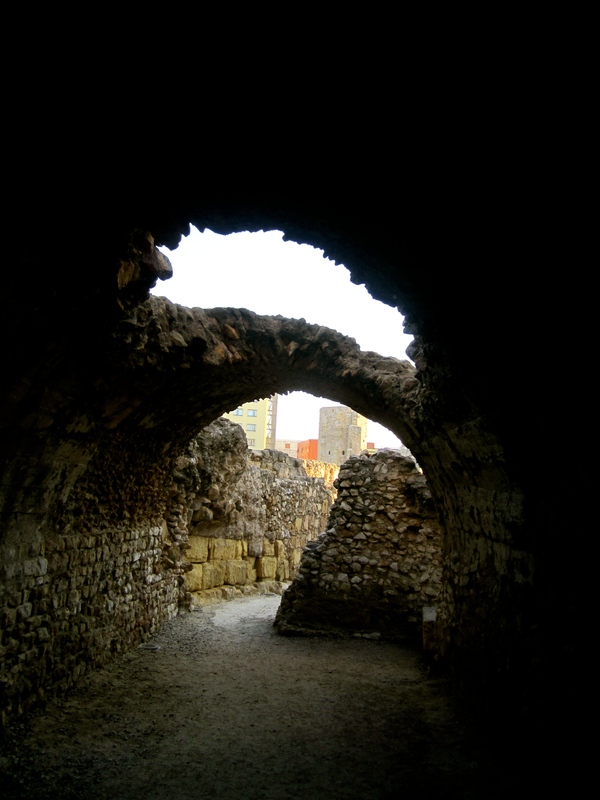 It is located within the city walls, which were built by the Romans, to protect its citizens from marauding intruders. The structural integrity of the amphitheater is slowly being compromised and weakened by trains rumbling past it all day and night. Strolling along the Mediterranean balcony. 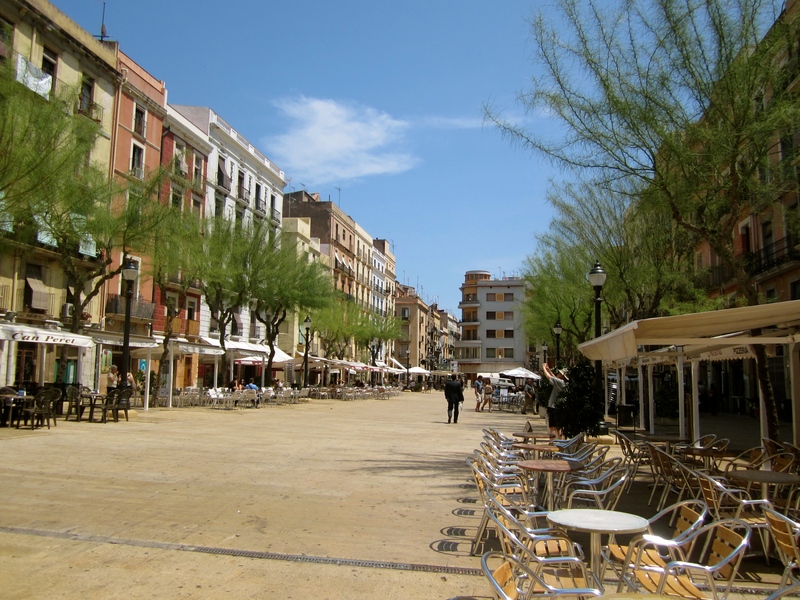 The Tarragona town square is quiet during the day, but the city comes to life, as soon as the sun goes down and the heat dissipates. 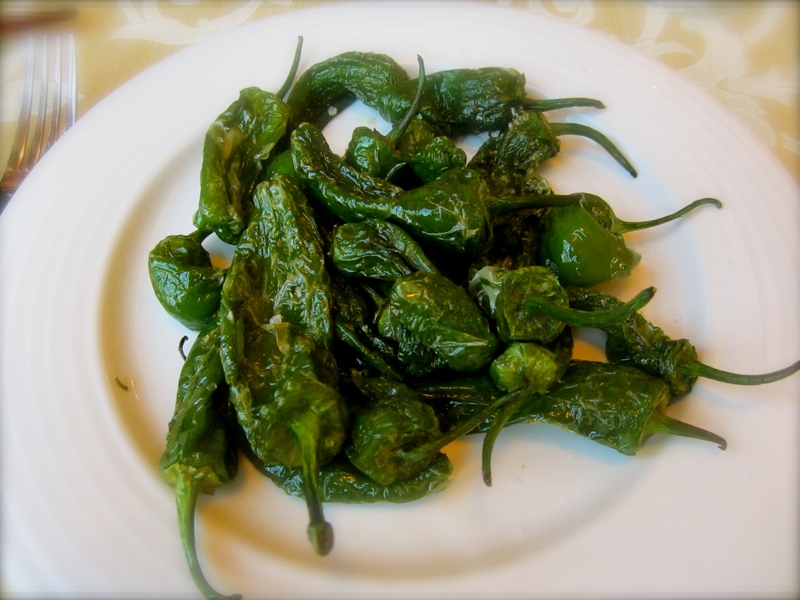 Tapas bars, restaurants and a variety of small shops line the city plaza and the numerous narrow and winding cobblestone alleyways in old town. 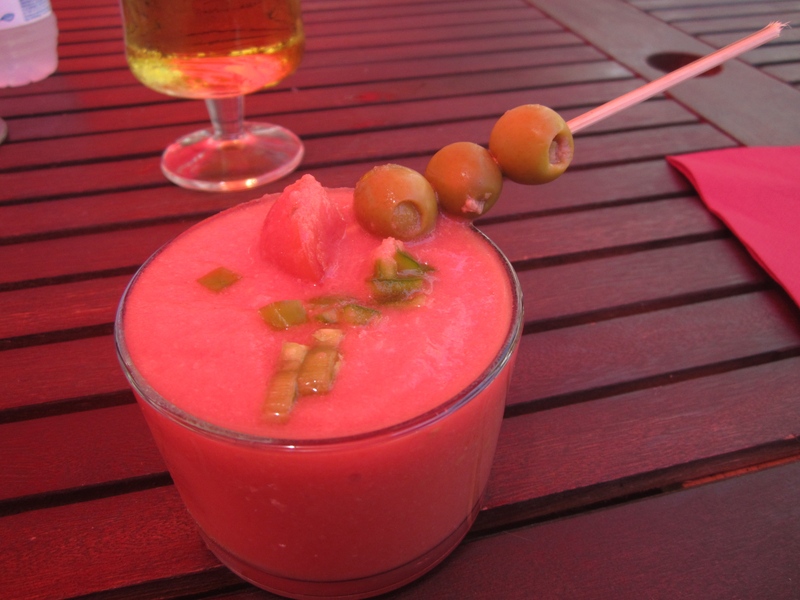 Salmorejo, a tastier version of gazpacho. Dinner at ‘El Pigot” on the town square. The National Archeological Museum exhibits an unbelievably extensive collection of ancient Roman artifacts. 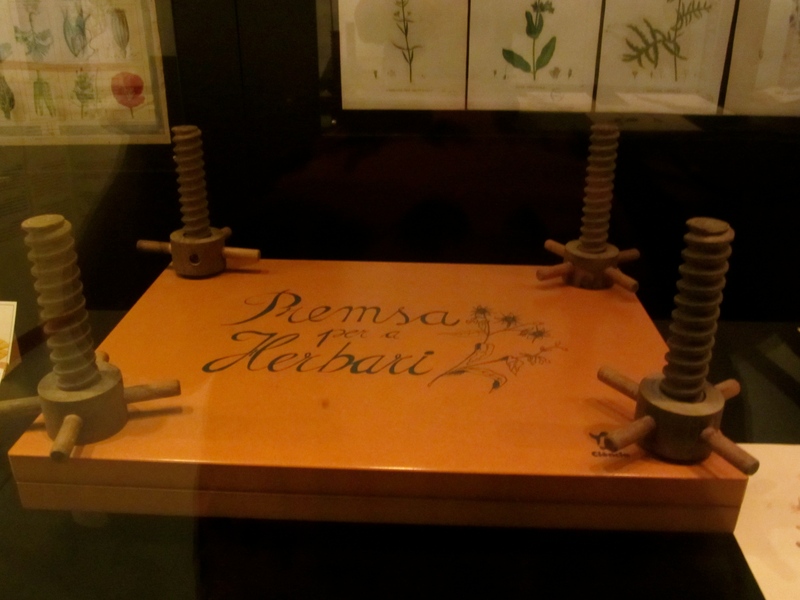 One temporary exhibit covered the history of herbal medicine and gardens during this timespan. Fascinating, how sophisticated these healers were. 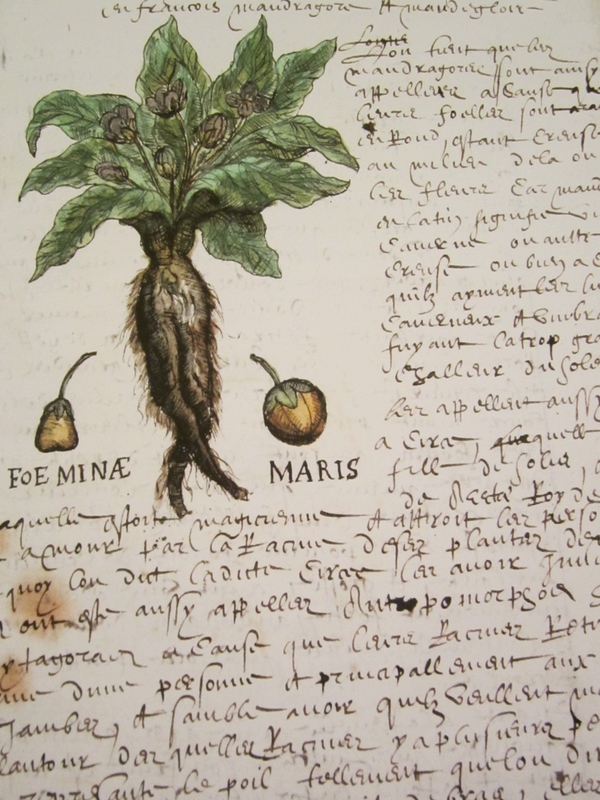 Tattered old notebooks on display contained notes, drawings of plants and recipes for medicinal remedies. 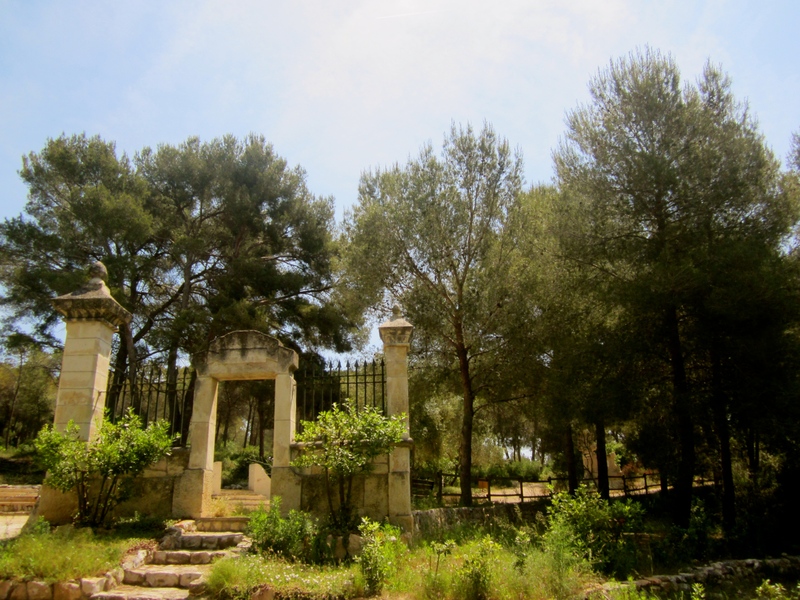 Ancient records on medicinal plants. 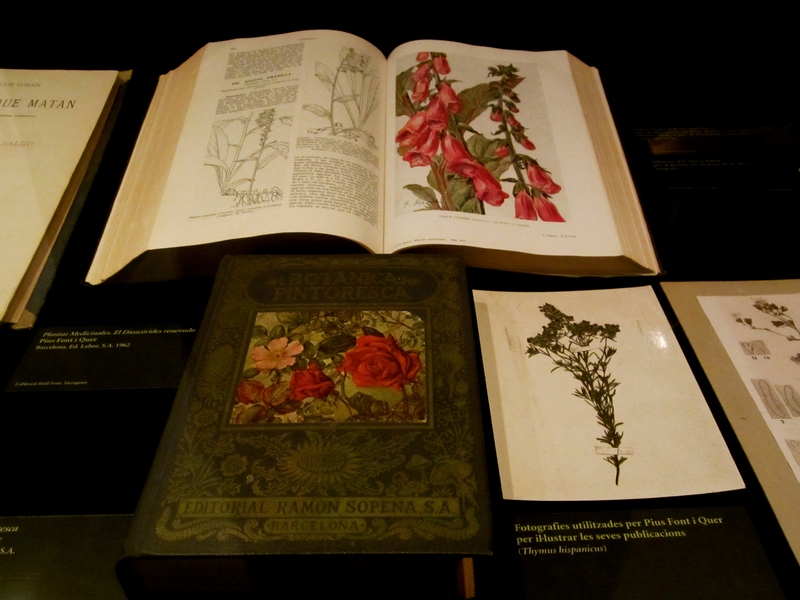 Well preserved records of plants. The spacious amphitheater could accommodate around 15,000 spectators. The nearby circus consisted of several building and a tower, all connected by a maze of underground tunnels. The circus was also used as a racing arena and had room for about 30,000 spectators. The Tarragona Roman circus, probably built during the 1st century. 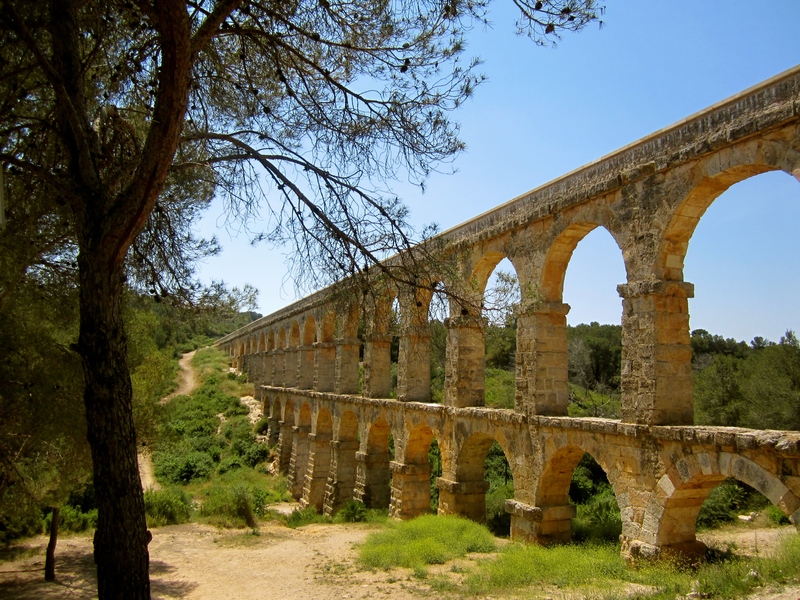 Just outside of town, we walked across the Pont de les Ferreres aqueduct. 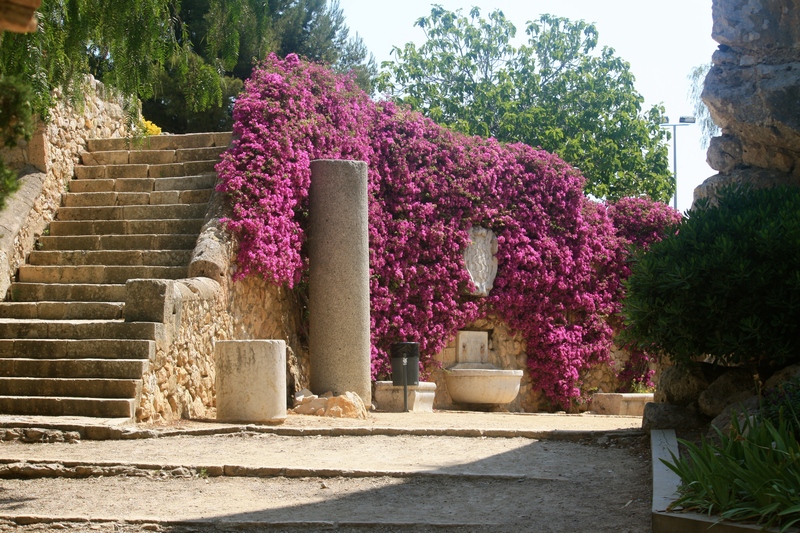 This structure was most likely constructed during the 2nd century AD. 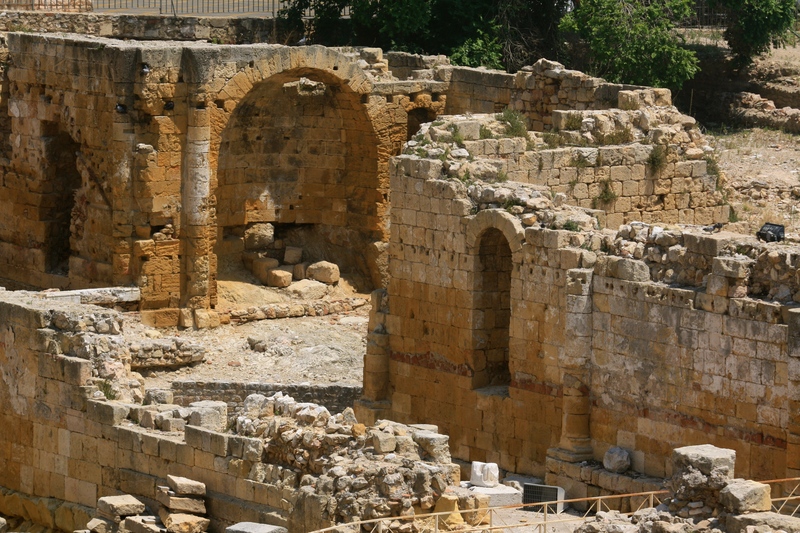 Its purpose was to supply Tarragona with freshwater from nearby rivers. Spectacular place — Incredibly, we were the only ones there that day. Entrance to the Pont de les Ferreres aqueduct. Incredible to experience all of this, up close and personal. Almost unfathomable what human beings were capable of building centuries ago, especially without the help of modern machinery! Imagine yourself carrying these humongous stones, day in and day out. 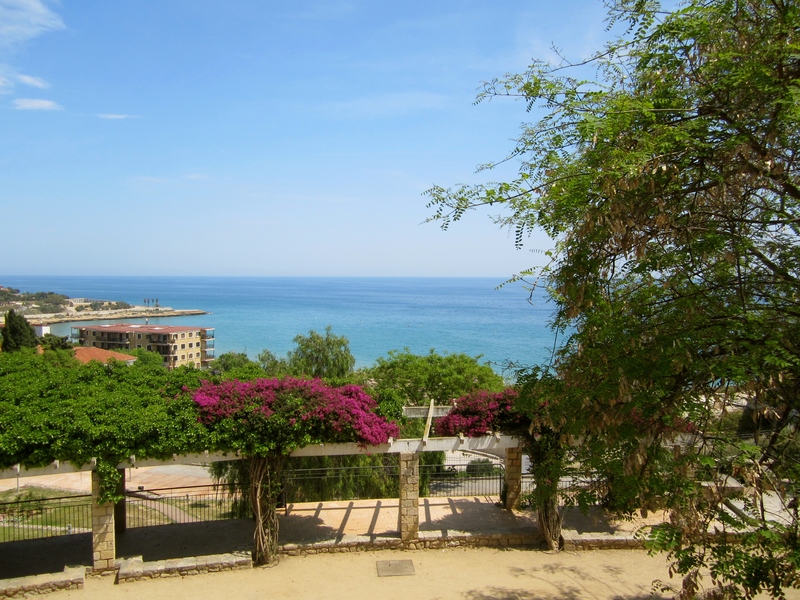 Some warm evenings, we strolled along the ‘Mediterranean Balcony’, a pedestrian path winding above the sea. 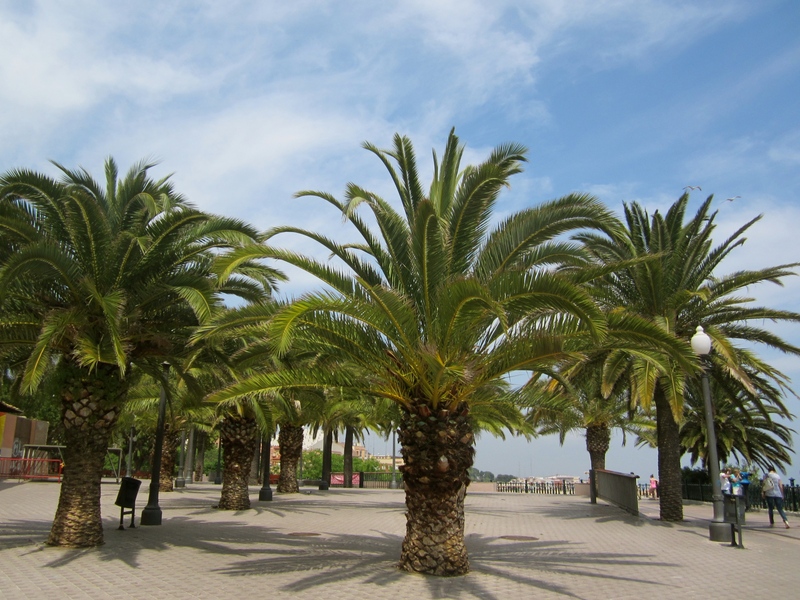 Breathtaking views abound, sky-high swaying palm trees, sparkling blue water; they all combined for a glorious look at the modern city of Tarragona. I marvel at the energy and effort invested by the Romans, in order to expand their empire on the Iberian Peninsula. The constant polarity between old and new left me in awe. 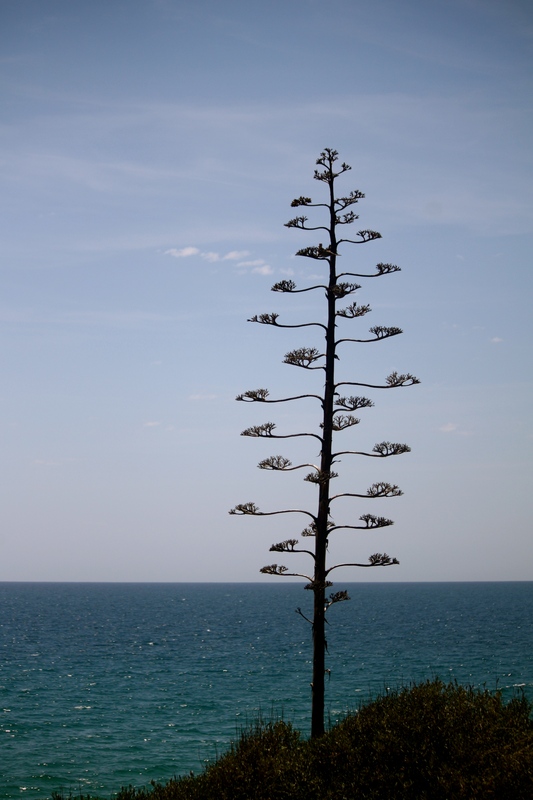 Spotted lots of these trees along the coast. 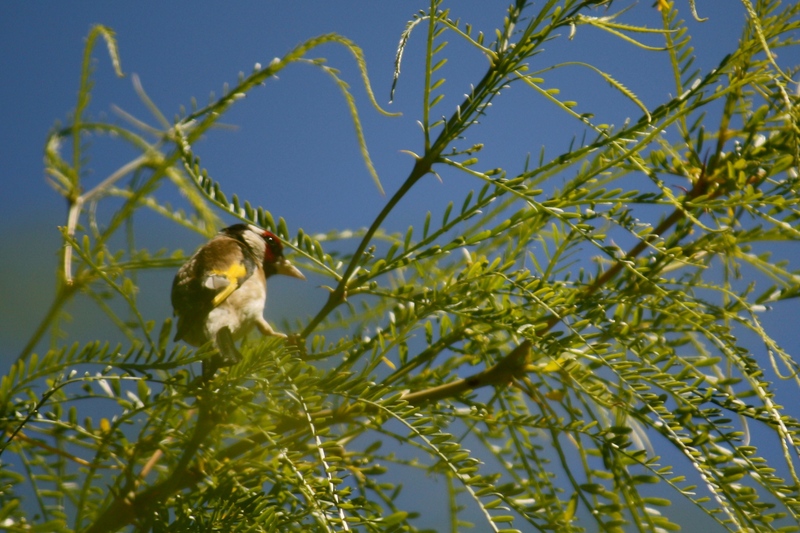 European Goldfinch! Lucky me, as he stopped only for a brief moment. ‘Homemade Dinner with a View’. 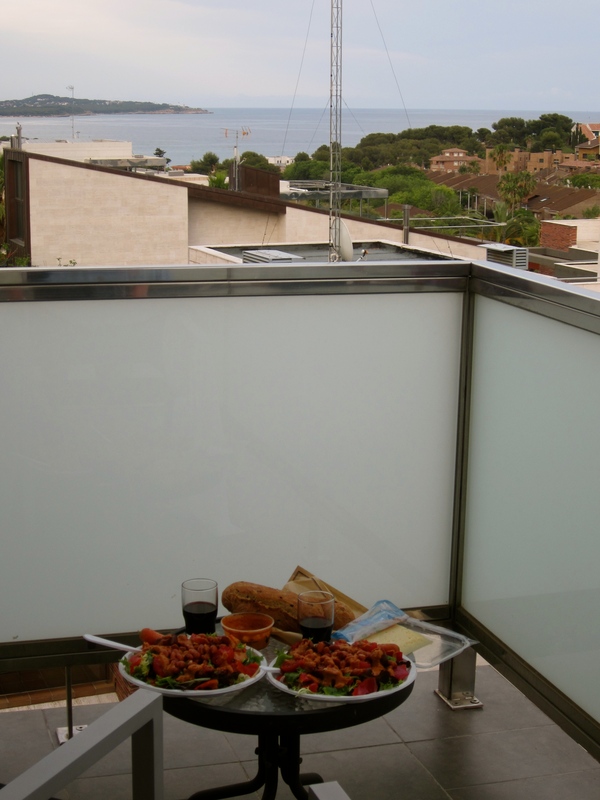 Many nights we simply bought some veggies and ate a salad on our hotel balcony. 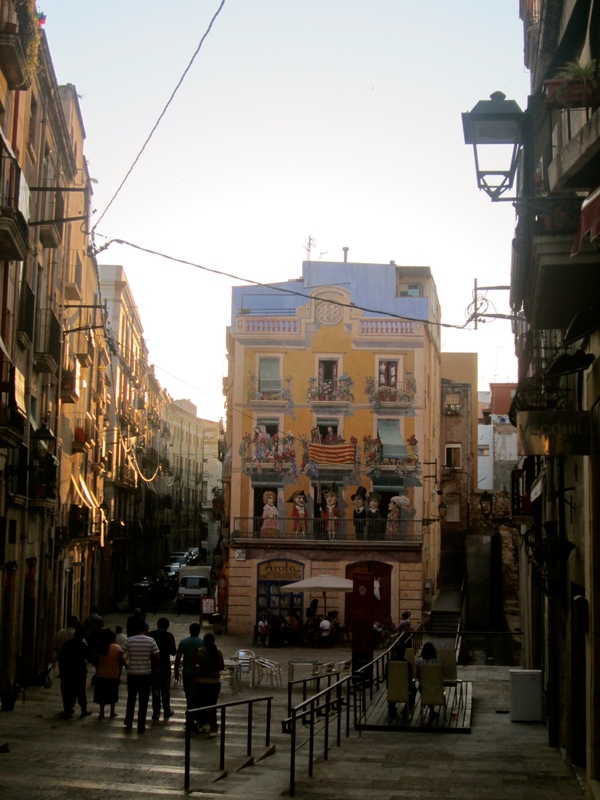 Tarragona made a great “home base” in between small trips to other places. There were very few tourists around, which was to our liking. 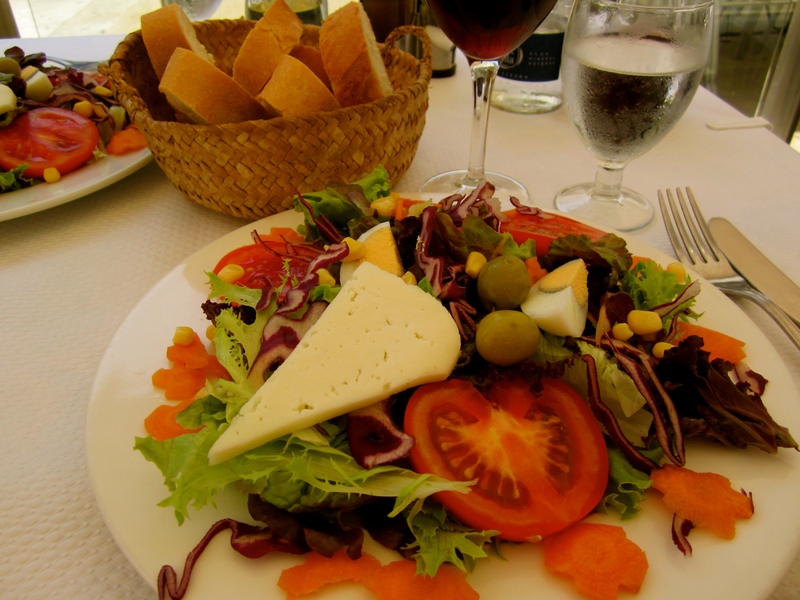 The Catalonian food was delicious, the restaurants were eager to accommodate vegetarians and the Spaniards were always helpful, whether we were looking for a bus connection, or anything else. What more could one ask for! 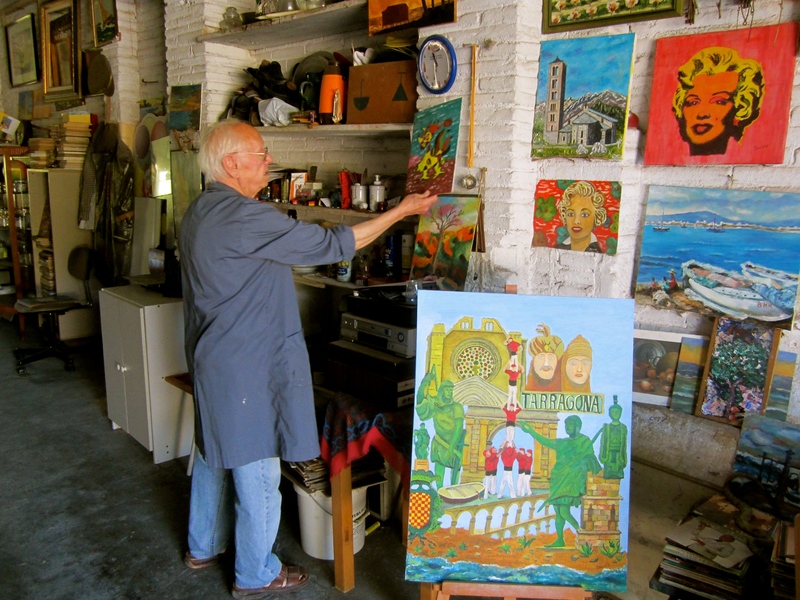 Paulo, the artist near our hotel. The ‘Rooster’ painting he is taking off the wall, came home with us. This painter was quite a character! His garage walls were covered with his paintings, including some nudes, which faced the back wall, to avoid offending visitors. One could only see those, if invited into the back portion of his garage. We chatted with him almost every day when walking by his ‘studio’, as he generally sat in his doorway, smoking a cigarette while watching the world go by. One of my favorite buildings in Tarragona. Various murals abound. 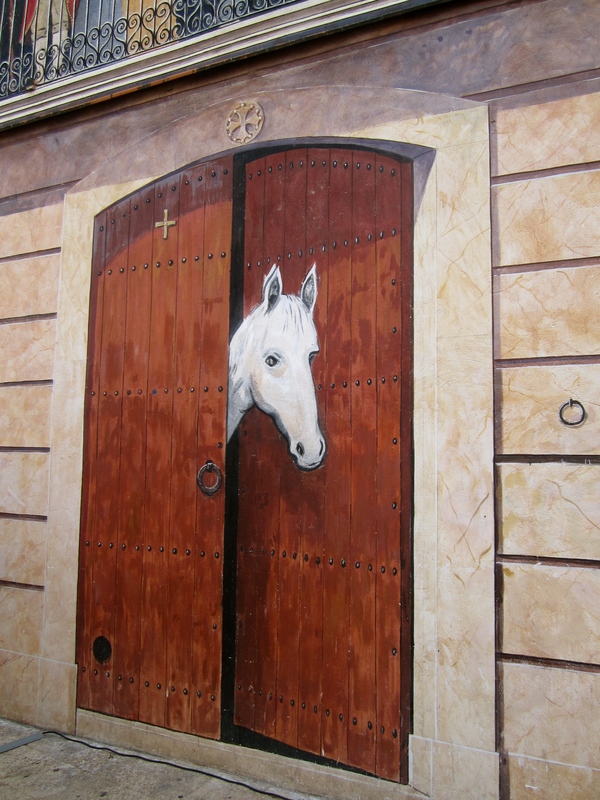 Isn’t this a great door? 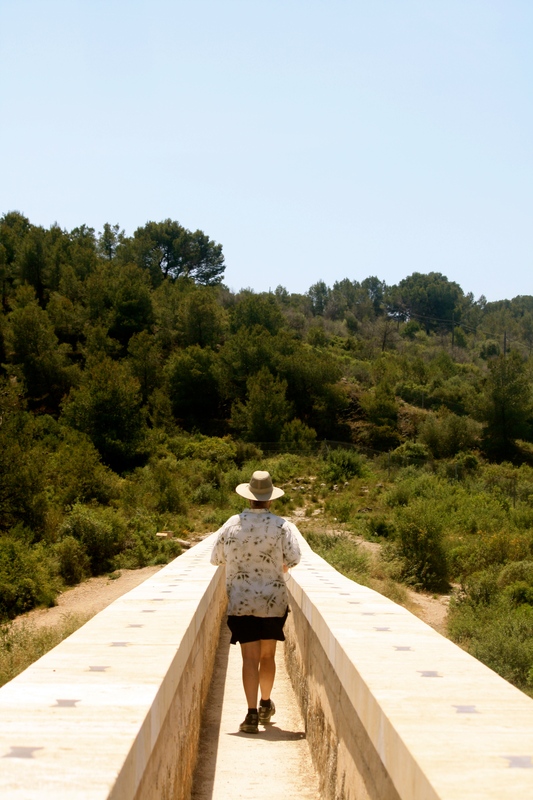 The pace of life is much slower in Spain. People remember to relax and to enjoy the moment. Entire families gather in the town square after sunset, sipping vermouth, eating dinner, chatting with neighbors and friends. Children ride scooters and play outside long after the sun has disappeared from view. It’s a very family oriented society. If given the opportunity to visit this amazing town, take it! To me, it is one of the most interesting places I’ve ever explored. Our feet were dog-tired every night from all the walking. We prefer to take public transportation whenever and wherever we travel, as it is a great way for us to meet the locals and immerse ourselves into the their culture and practice foreign languages. That’s what traveling is all about for us. In addition, we pack very light, always stay flexible and avoid the crowds by taking advantage of the ‘shoulder season’. Rosalie would like Spain! Even though we were there for almost three weeks, we barely scratched the surface. Glad you both enjoy the pictures. Love this! Just stunning pictures and travelogue. Thank you! We had a fabulous time in Spain, especially in Montblanc and Tarragona. Thank you also for stopping by my blog. I think you would like it. 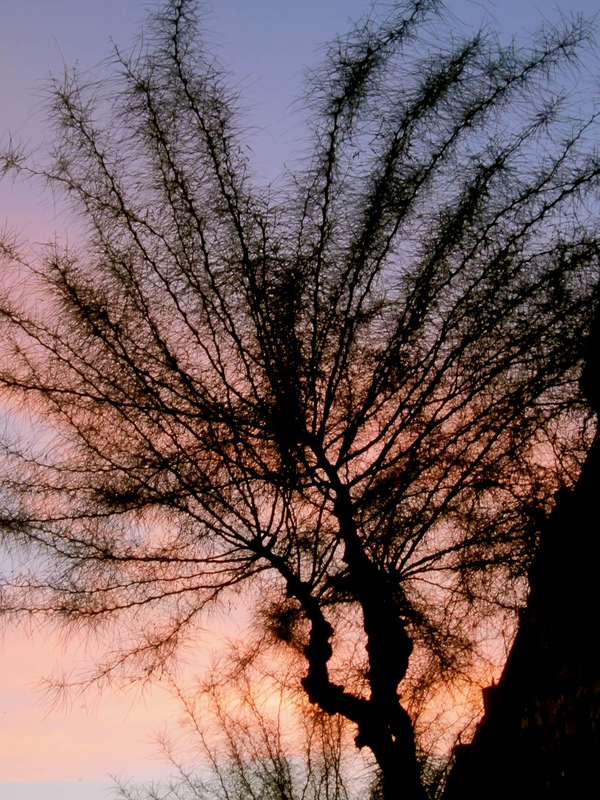 We always try to avoid the touristy areas and by traveling during the shoulder season. Generally a lot cheaper, less crowded and good weather. I’ll be back to check your blog out this weekend. That’s our style of travel as well. 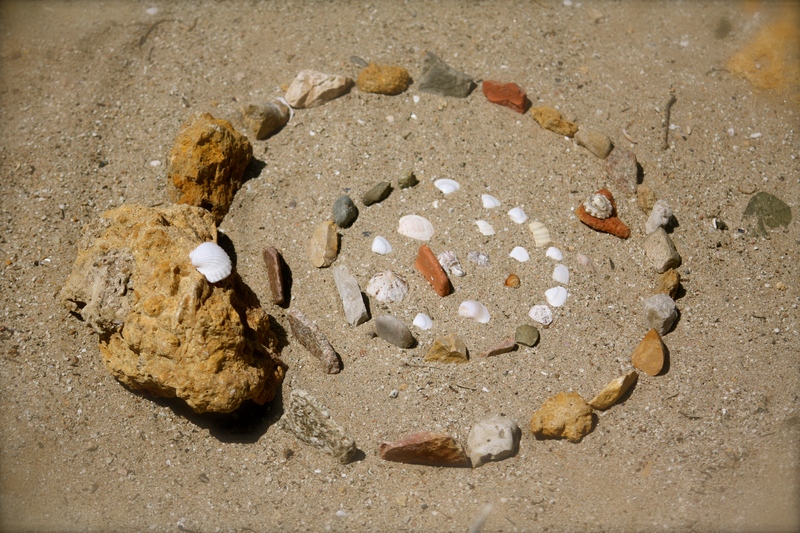 We love discovering those things you find off the beaten path! Me too! I am having a drink right now: a glass of Beaujolais to extend the adventure of France a bit longer. Lunch soon? Maybe next week after we get back. I’ve been on overwhelm so long that extreme exhaustion set in. Took some time off from everything. Enjoy being home. Next week is good if you feel up to it. Glad you are taking it easy! Enjoy the trip. Misty really liked it there last year. I’ve been there before but the kids haven’t. Not sure I have the stamina for it anymore. 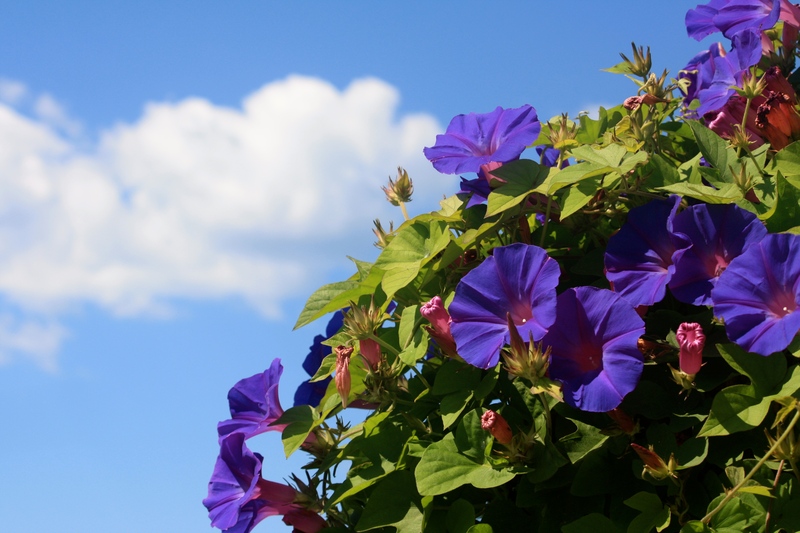 We are mainly doing Butchart and the butterfly garden. Planning on high tea at Butchart. That’s about all the time we will have. It’s not how much you do, but the quality. Sometimes less is more. Have fun!